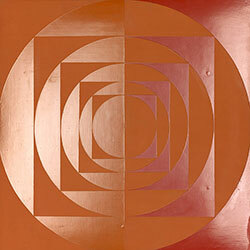 Willys de Castro (Brazil, 1926–88), Objeto ativo (cubo vermelho/branco), 1962, oil on canvas on plywood, 25 x 25 x 25 cm. From the Colección Patricia Phelps de Cisneros. Photo: J. Paul Getty Museum. Fall 2017 will see the culmination of the Getty’s multiyear initiative, Pacific Standard Time: LA/LA, in which forty-six exhibitions and events on Latin American and Latino art will take place across Southern California. One of those exhibitions—Making Art Concrete: Works from Argentina and Brazil in the Colección Patricia Phelps de Cisneros—will open at the Getty Center itself in August 2017. This exhibition is an outgrowth of a Getty Conservation Institute (GCI) collaboration with the Getty Research Institute (GRI), which is undertaking a technical and art historical study of Argentine and Brazilian artworks loaned by the Colección Patricia Phelps de Cisneros. Thirty works from the collection will be presented in the exhibition, along with initial findings from the research, which is enlarging our understanding of techniques and materials used in these works. 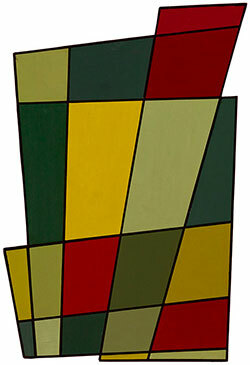 The Colección Cisneros artworks date from 1946 to 1962 and are characterized by a severely reduced, geometric vocabulary. The young Latin American artists who created them called themselves “concrete,” which to them meant that their compositions were rooted in reality and did not reference anything outside of themselves, such as nature. Hélio Oiticica and Lygia Clark considered themselves Neoconcretists and are probably the best-known artists of the group. The study also includes works by Rhod Rothfuss, Alfredo Hlito, Tomás Maldonado, Geraldo de Barros, Hermelindo Fiaminghi, Waldemar Cordeiro, Judith Lauand, and Willys de Castro. The relative scarcity of compositional elements to distract the eye permitted the artists to lavish their attention on every little detail—the exact method used to paint a straight line, for example, or the process to achieve a perfectly homogeneous surface. The seeming simplicity of the compositions belies the artists’ painstaking approach to materials and technique: the truism applies that the most simple-looking things are often the hardest to accomplish. The opportunity to examine in depth the art production of this period presented itself when the Colección Cisneros generously agreed to lend the Getty forty-seven important and representative works for three years. Of the various categories of art in the collection, the focus of the study is on paintings and three-dimensional works because their complexities are best suited to allow comparisons between what the artists had expressed as their intent—for example, in manifestos—and what they actually achieved. Fueled by utopian and left-wing ideas, the Argentine and Brazilian concrete artists wanted to create “nonelitist” works with universal appeal. One of their strategies was to strive for the elimination of obvious traces of their hands—in other words, their individual involvement in the process. They saw themselves as working within the continuum of modernist European and North American abstraction, but as the new Latin American avant-garde who took their predecessors’ achievements to the next stage. This evolution included the adoption of a number of materials and techniques that signified their embrace of mechanical aesthetics, though with significant variation among the artists in the degree of perfection aspired to. Juan Melé (Argentina, 1923–2012), Marco recortado no. 2, 1946, oil on hardboard, 71.1 x 50.2 x 2.5 cm. Front and back. From the Colección Patricia Phelps de Cisneros. Photo: J. Paul Getty Museum. 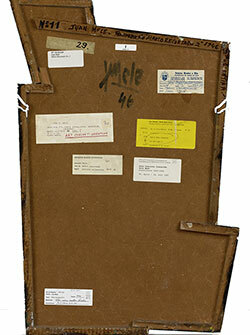 One of the earliest works is the Marco recortado (cutout frame), an irregularly shaped 1946 work by Juan Melé. By letting the grid structure of the composition define the outline of the work, the artist eliminated the illusion of the painting being a window into the world. Canvas would not have been a suitable support because of its texture and flexibility, and so Melé chose a rigid, smooth hardboard panel. In the United States these panels are known as Masonite, after their inventor, William H. Mason. In 1926 he patented his process, which is based on hydrolyzing wood chips, followed by pressing them into flat metal plates and/or screens (the fibers are held together by the naturally present lignin, rather than by an added adhesive). The panels have two smooth sides or one smooth and one textured canvas-imitating side. It was the perfectly napless surfaces of these panels, without canvas texture or wood grain, that made them popular with the concrete artists. Hardboard panels are also easy to cut and lightweight, and they are an inexpensive alternative to solid wooden panels. But they are prone to swelling, warping, and twisting; Melé addressed this instability by nailing wooden bars cut to size to the reverse of the panel. The bars also added some depth, protected the edges from fraying and denting, and provided a mechanism for hanging. Concrete artists in São Paulo, especially members of Grupo Ruptura, adhered deep wooden box constructions of up to seven centimeters to the reverse side to create a sense of the objects hovering in space. Scientific analysis of the artworks included medium and pigment analysis of the paints, as well as examination of paint cross sections. Six main categories of binders, natural and synthetic, were identified: oil, oleoresin, alkyd, polyvinyl acetate (PVA), nitro-cellulose, and acrylic. The presence of acrylic generally points to later overpainting and retouching (by the artists themselves or conservators). Most of the oil paint was detected in the Argentine works, but the vast majority of works were executed with industrial paints, based on nitrocellulose, oleoresin, and alkyd. These paints were formulated for indoor, outdoor, and specialized applications, such as automobile finishes, and they were chosen by the artists for very practical reasons: they are less expensive than artists’ oil paints, and they dry faster to a tougher, smoother finish. The Brazilian artist Hermelindo Fiaminghi, for example, exploited the fact that some manufacturers also produced alkyd paints with varying amounts of pine resin and therefore gloss, which allowed him to juxtapose very shiny red and orange shapes on top of a very matte background layer. In the mid- to late 1950s, Lygia Clark began to work with spray applications of nitrocellulose, another strategy artists adopted in their desire to create surfaces devoid of subjective handwriting. Função diagonal by Geraldo de Barros displays the most industrial-like, perfectly smooth finish of any of the works of this period, a feat that he achieved in part by using an unusual paint mixture—a polyurethane-modified alkyd, probably mixed for him by another Grupo Ruptura artist and friend, Kazmer Féjer, who had studied industrial chemistry and who experimented in his kitchen with plastic substances. De Barros also applied the black paint with a spray gun, and in addition hand polished the black paint areas with sandpaper. Polish marks were observed in many Argentine and Brazilian works and are remnants of an alternative strategy employed to achieve impersonal, or, as Judith Lauand put it, “depersonalized” surfaces. By contrast, Aluísio Carvão in his neoconcretist period focused on finely nuanced color contrasts and sought ways to activate his paint surfaces—for example, by incorporating painted wooden sticks. Carvão also leached his paints by removing excess paint medium, which led to extremely dry, underbound paint layers. His homemade brushed ground and paint layers are also tightly packed with colorless, lumpy aggregates of fillers, such as gypsum, talc, silica, barite, and dolomite. Polyvinyl acetate and a mixture of alkyd and beeswax were identified in two of his works. The beeswax was probably added by Carvão to increase mattness, and although the synthetic PVA is a rarity in this study, it is commonly found in non-gloss house paints. Hermelindo Fiaminghi (Brazil, 1920–2004), Seccionado no. 1, 1958, alkyd paint on hardboard, 60 x 60 x 6 cm. From the Colección Patricia Phelps de Cisneros. Photo: J. Paul Getty Museum. Interestingly, the Argentine concrete artists refrained from using self-adhesive tape, which was fervently embraced by many of the Brazilian artists. Judith Lauand, for instance, made frequent use of it. She, like Fiaminghi, de Barros, and Clark, preferred Scotch Tape (“Durex” in Brazil), the transparent cellophane kind that leaves a very straight paint ridge, as opposed to masking tape, which is made from crimped paper and leaves a slightly ribbed edge. Willys de Castro, also a Neoconcretist, was known to be a perfectionist, and his personality shimmers through in everything that characterizes his objetos ativos, such as detailed and accurate inscriptions on the reverse of the artwork as well as a solid, neat working method. 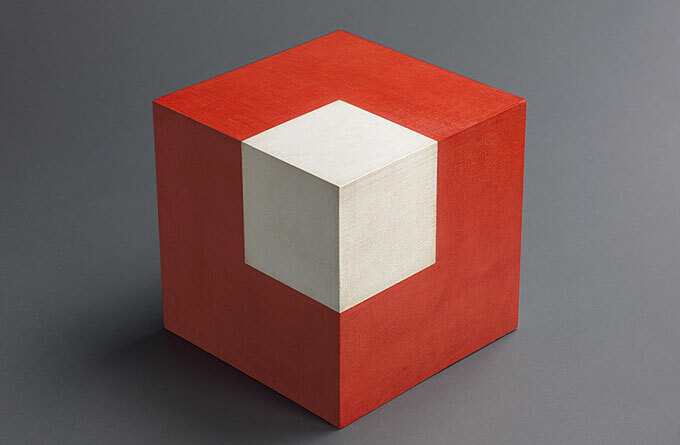 Objeto ativo (cubo vermelho/branco) from 1962 consists of white, preprimed canvas glued to a cube construction made from plywood and wooden corner splices. De Castro took extreme care to avoid overlap of the canvas seams at the edges of the cube: he cut a single piece of canvas the exact length of four squares, one meter, and one additional flap stacked at one end. The artist’s careful brush application of the tube oil paint near the white elements parallel to their edges makes it difficult to ascertain if he used any aid. However, the fact that a few of the brushstrokes in the white squares are oriented in a right angle towards their edges suggests that he used a straightedge, and the subsequent narrowing of them by scraping away a band of two millimeters all around might have eliminated a ridge. These edges are razor-sharp—an astounding manual feat and testament to de Castro’s superior craftsmanship. The GCI-GRI research on the Colección Cisneros is slated to last three years and is already providing a great amount of new information on these artists, the work of most of whom has not previously been studied from a technical point of view. A greater understanding of materials and techniques used by these artists will both increase the body of knowledge for art historians and allow conservators to devise treatments specific to artworks from this period. On some level, a 1960 statement by de Castro applies to all of the artworks examined in this study: “The technical requirements of the lasting and clear execution of the generating idea…are what guarantee the artistic state of the work, and increasingly what prevent it from returning to the primitive brutality of the raw materials.”2 Whether they were using artists’ materials or industrial products like house paints and hardboard panels, it was the artists’ highly refined skills in manipulating them that resulted in some of the most important and mesmerizing artworks of the twentieth century. Pia Gottschaller is a GCI senior research specialist. 1. Sonia Henríquez Ureña de Hlito, ed., “Biografia sincrónica de un pintor,” in Alfredo Hlito: escritos sobre arte (Buenos Aires: Academia Nacional de Bellas Artes, 1995), 205. 2. Willys de Castro, “Objeto ativo,” in Roberto Conduru, Willys de Castro (São Paulo: Cosac Naify, 2005), 220. In conjunction with the GCI-GRI initiative—and with funding from the Getty Foundation—art historical and technical studies on artworks by Latin American artists of the period are underway at LACICOR, the Laboratório de Ciência da Conservação of the Universidade Federal de Minas Gerais in Brazil, and at TAREA, the Instituto de Investigaciones sobre el Patrimonio Cultural at the Universidad Nacional de San Martín in Buenos Aires, Argentina. In addition, the Museum of Fine Arts in Houston is carrying out technical studies on its own Brazilian art collection from the period.